And this made me think of a blog post I read a few months ago. I think it was a rather silly anti-dogme post, full of poorly made arguments and incorrect assumptions, and was clearly spoiling for a fight. Somewhere in the article there was a swipe at those of us who see don’t see students as being particularly different, wherever in the world you teach. The article was already irksome because of its anti-dogme stance, and this just added salt to the wound. I’m one of those people. I’ve taught in Brazil, South Korea and now Belgium, three utterly different cultures and in very different teaching environments. And yet I have never found my students to be that radically different from each other in any of those countries. When you think it about it, it does seem unlikely that they could be so similar, but that’s what my experience bears out. All over the world, English language learners are on the receiving of very similar teaching methodologies. At worst, they might sit in lecture rooms and have grammar classes in their own native language, followed by some translation. If they are a little bit luckier, they might have a colourful coursebook that in no way reflects their own life and invites them to discuss what they had for breakfast (a reductive stereotype I know, but you get the point). The vast majority of students may well come through this mill before they end up in our classroom, and that’s why they are so similar, because most of them may have always had the same relationship with English language learning i.e. a boring one. That doesn’t even take into account the fairly limited range of goals we normally encounter, which are usually related to work, travel or “because English is so useful nowadays” (and who’s going to argue with that?). Our students are in our classrooms, having had similar prior experiences with the language and with similar objectives, no matter where in the world they live. And sure, there are some very general national characteristics that are true, but when you get down to the nitty gritty and really get to know your students, those traits really aren’t that important. On the surface my Korean students were reserved and quiet, but after a while, you discovered that for every quiet learner there was a class clown or show off. So while it might sound reductive to claim that everyone is the same, it’s quite the opposite and claiming that a Japanese class needs to be taught in a Japanese way is more reductive and patronising to me. And that’s why, I reckon, with the right level of local cultural sensitivity, we can find that we don’t need to radically alter our teaching style or our expectations of students needs. The thing is, I don’t approach my class as being a Brazilian one or a Korean one. Basically, I don’t teach Brazilians, Koreans or Belgians, I teach Paulo, Min Jee and Vincent. The idea of teaching an English class in, for example, a Japanese way would mean that my current job would be incredibly difficult. At present, I am teaching a multilingual class of 9 Intermediate students covering 6 different countries: 2 Turkish, 1 South Korean, 3 Saudi, 2 Thai and 1 Brazilian. They don't even come from the same language family, let alone the same country. One of the things I constantly hear from my students include “In [insert name of country here], we always translate things at school.” I then ask other students if the same happens in their country, and point out that that is one of the ways I learnt French/German as well. I think it helps the learners to see that they are all in some way similar, to combat the idea that “People from X can't learn English well”. As you suggest, in an ESL setting this idea is clearly ridiculous and and unhelpful. And as you state, despite the wide variety of cultures your class contains (and it sounds great! ), they share a similar learning background. This is the common bond which enables you to teach them in your way, and without having to alter or change your teaching style based solely on the cultures you encounter. And I'm glad to hear that they are changing your perspectives. That's one of the best things about teaching, isn't? Thanks for synthesising this all, James. Will have a proper read once my obs is done today – wish me luck!! It's funny how people always pick on these cheeky asides and comment, isn't it? 😉 I suppose you could turn a breakfast lesson into something interesting, but as you say, I don't think it's going to come from a book. I am a DELTA qualified English as a foreign language teacher, teacher trainer and materials writer currently based in Brazil. I have taught English to adults and teenagers in Brazil, South Korea, Belgium and Costa Rica since 2007. I am currently specialising in bespoke one-to-one lessons for business and exam students. In August 2018, I self-published my first ebook, entitled "How Was Your Weekend? 1001 Discussion Questions To Use With Your EFL/ESL Students" and I'm currently writing my first coursebook series for FTD Education in Brazil. I am also a podcast consultant, including the ELTON nominated TEFL Commute podcast, IATEFL TDSIG's Developod, and Seven Skills For The Future. I am a former President and a co-founder of BELTA, the Belgian English Language Teachers Association. Currently I am Second-Vice President of BRAZ-TESOL Brasília and a committee member of IATEFL TDSIG. 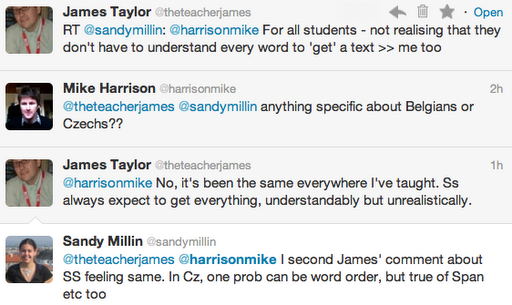 In 2010, I started my blog, theteacherjames.com, on which I have continued to share lesson materials and opinion pieces. I am a very active member of the ELT community and regular present at conferences, both online and offline. My new book – Raise Up! My New Book – Now Available! Beatriz Solino is a Ca,bridge Delta Modules 2 and 3 holder and she has a Licentiate’s degree in the English Language from PUC SP (2007). She also holds the CPE (C2) level of proficiency and she has been teaching for 15 years. She has also been working as an Academic Coordinator for 5 years at Cultura Inglesa Jundiaí. She is currently the treasurer at BRAZ-TESOL SP CHAPTER 18-20 and the co-founder of circular.club. Feel free to add your comments and/or feedback and also to ask questions! The musings of a TEFL-er in an unplugged world. A site for English students and teachers. Blogging about research, technology and language learning.